Crisis, what crisis? The tabloid headline used to pillory the Labour government of 1979 could well be dusted down and applied to Theresa May’s administration today. As May plodded through another pedestrian performance at PMQs, with the impact of the Tories’ NHS negligence laid bare, it was hard not to recall the words of the red-top which were used to criticise Jim Callaghan nearly 40 years ago. May, of course, doesn’t have the charm of sunny Jim – at least in public – but she is engaged in a similar battle for political survival. 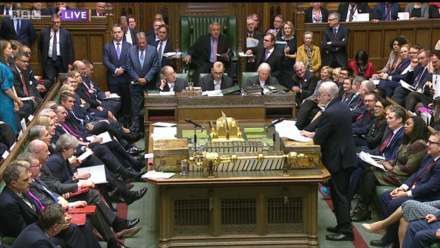 The troubles facing the NHS were at the forefront of today’s debate and it was those, as well as the troubles facing the interim PM herself, that allowed Corbyn to score a few points against his opponent. Labour’s leader emerged as he the winner after marrying the Tories’ running down of the health service with the disastrous cabinet reshuffle which May carried out on Monday. “The prime minister needs to understand that it is her policies that are pushing the NHS into crisis – tax cuts for the super-rich and big business are paid for by longer waiting lists, ambulance delays, staff shortages and cuts to social care. Creeping privatisation care is dragging our NHS down,” Corbyn said in his final question, amid Tory jeers. Beyond that, it was not a vintage session, but Corbyn was right to focus on the NHS and its creeping privatisation. The winter crisis, as shadow health secretary Jon Ashworth said this morning, is the “worst on record”. Labour holds an opposition day debate on it this afternoon and it is clear that May has no answers. It was a simple question and showed how he is better off delivering direct questions, as suggested on LabourList this morning. May repeated her apology to people whose operations or hospital admissions were delayed. This was clearly the right thing to say but will offer cold comfort to those forced to go about their lives in desperate need of a major procedure, such as a hip replacement. And as for the politics, well it showed how May has lost her touch, if ever she had one. Only two days after he new year re-launch and she was issuing apologies. Another one would follow when the PM began a scripted attack against Angela Rayner – who last week told The Spectator that Labour’s economic strategy is “sh*t or bust” – before it was pointed out the shadow education was absent because she is receiving medical treatment. May, to be fair, immediately said sorry “unreservedly”, saying she did not realise why Rayner was away. Labour sources said the Tory whips had been informed as part of the “pairing arrangements” – when MPs from both sides cancel each other out when missing votes because of health reasons or other unavoidable concerns – but the exchange underlined the fact that the PM often seems unlucky, ill-prepared or incompetent. May fought back on Labour’s economic plans and made a reasonable fight of it but, once again, she lacked a killer argument. Corbyn’s question on Virgin Care, prompted by the notorious payment to Sir Richard Branson’s health firm after it failed to win a contract in Surrey, allowed him to develop his criticism of the advance of the private sector into a state service. Labour’s leader will feel he scored a decent win on one of the core issues facing the country. May simply plods on, seemingly unaware that her constant claim that Labour wants to take the economy back to the 1970s has a painful parallel in her own government, which has an end-of-an era feel about it.